The news today is of course Obama deciding to renew ties with Cuba after about 50 years of embargo and what not. I will not even bother to put up a link, just open your Google News section. I am not going to argue the pros and cons. One thing is clear and it is that the embargo has not worked, has furnished the odious Castro criminals with an excuse that they have milked beyond the udder. Yet the failure of the embargo was not the idea per se, but the way successive weaklings applied it, speaking tough when the Miami Cuban vote was needed, forgetting about it as soon as they were sworn into some elected office. Clearly something had to be done and I am too busy, too overwhelmed by my own life and home problems to give you the opinion of my crystal ball about the well founded of that initiative of Obama, or any other possible one. However I am going to concede one thing: whether Obama is misguided about this outing, it is certain that he is the only one that could take such a gamble. His presidency is over, he lost baldy recent elections. The guy has nothing to lose and it is quite possible that his decision is more than just a bow to the left of his party that he does not need anymore, anyway. Sometimes state decisions must be done and someone has to wear the hat and assume responsibility for all past mistakes and/or successes that led nowhere (both, it is an abstract thought, bear with me). I would not be surprised that we learn someday that some high flying Republicans may have secretly encouraged the embers of this White House to take a step that serves, well, so many people right and left. After all, let's not forget that Nixon went to China and even got an opera named for his trip. What rules over the world, in the end, is not what people think it is. 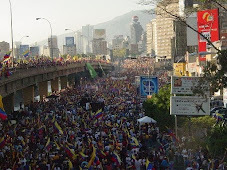 But this is a Venezuelan blog and as such I am going to write next about what this all means for us. For one thing, all the recent anti US actions from Venezuela and chavismo against the US of A are now under a different look. The utter misguided foreign policies of Maduro and his combo reveal one thing: they had no clue about what Raul Castro was doing. They were in the dark. They were never allies of the Castros as Chavez tried to make us believe for too many years: we were just a Castro colony, a pawn with an accidental wallet to pluck. Now the proof is in front of the dumb chavismo. Now what for them? Are they going to keep screaming about possible sanctions from the US towards the most corrupt of chavismo? (it took the official media of the regime hours to announce the news officially). Another thing is that the way Raul Castro has dumped Venezuela for the US tourism dollar. Now that Venezuela is bankrupt, the only quick fix available for Cuba is to open its tourism to US visitors, and to Miami Cubans eager to come back and buy back, say, their ancestral home. Raul Castro, for all practical purposes, told us today that Venezuela is done, that he cannot leech much more from it, and that he dumps us without ceremony. We are broke and not even the most idiot of chavistadom can pretend to ignore that for much longer. But what worries me the most about the whole Raul-Obama deal is that a wind of impunity is blowing through the Caribbean. Thousands of Cuban criminals that supported the Castro horrendous dictatorship are now going to go Scott free. Sure, a couple of them will be somehow sent to trial, scapegoats for decades of tyranny and errors. But it looks like the Castros are now going to die peacefully in their bed while the cult to Che will grow even stronger as throngs of lobotomized US tourists will be driven to the high places of Che crimes. Is this last part going to affect us. Maybe. Maybe not. Who is to say that in exchange for forgiveness for his own henchmen Raul is not willing to deliver the Venezuelan narco traffickers to US authorities? Is Venezuela part of the deal, as a token present to Europe and the US? As this blog sort of agreed commenting a few months ago the predictions of Rafael Poleo. More interestingly, if Raul is really going to dump Venezuela, could that mean that this is the end of chavismo economic policies, when there is not much worth left to save? If Maduro was all along the mere representative of Cuba in Caracas, a pro consul if you wish, what is his future now? Let's just hope that this way will indeed be less costly than a civil war in Venezuela. Nixon sat down with Mao who killed 30M people. Bush 2 sat down with Putin who has killed/imprisoned many. The USA maintains diplomatic relations with Belarus even though Lukashenko is a brutal dictator. The USA has constantly maintained diplomatic relations with Egypt even with mass imprisonment of dissidents. The Cuban issue has ALWAYS been about EMOTION and not realpolitik. South Africa let most folks go through truth and reconciliation following their issues. In Libya the did kill the dictator. I'm not sure that helped much. So extracting vengangence is important, but much more important is what happens to the country. In this area you are completely accurate. Cuba is looking 1 year into the future, Venezuela will not be worth the billions from buying and then reselling the oil. Despite what Muduro "guarantees" about the economy, the economy is going to be toast. As the price of oil gets closer to production cost, each dollar drop has an even greater impact on profitability. The difference between the official 6.3 rate and the real rate is not 5-10%. It is 30x! Those without US Dollars in their hand, or waiting for promises of US Dollars and financing out of their own pocket, or keeping savings in the "Strong" bolivar are going to be in trouble. Those who asked for payment upfront, then converted to dollars, then delivered goods later are going to be very happy, a bunch of smart business I think have done this with success. Maduro is shitting his pants tonight. Chavismo is toast! I wouldn't trust the Castros for 2 seconds. They are not going to change overnight. They will continue to jail disenters & cramp press freedoms. They are like Iran & it's never ending nuclear controls. Like a giant balloon filled with oil. Press on one side & the other pops up. Be careful Obama - this could come back to bite you. What just happened shows acceptance of Cuban control over Venezuela which is the main blockage to the return of Democracy.The US knows Cuban intelligence permeates all levels of Venezuelan society and especially the military.As Venezuela is still nominally ( or at least according to the State Department) an albeit imperfect Democracy, the dream that some Venezuelans now have that a military man can step in and chase out the Chavistas is more unlikely than ever. One thing is a prisoner exchange and resumption of diplomatic relations, and quite another is the nullification or otherwise of the Cuban Liberty and Democratic Solidarity (Libertad) Act of 1996 (Helms–Burton Act), which is a federal law. The act was passed, among other reasons, to recover compensation for assets or property of US citizens expropriated by the Castro regime without compensation. You know, Chavez-like "expropiese". Clearly, if the Cuban regime tries to do business with the US, it will find itself in court. Plenty of the Castro victims are now US citizens, and have the right to claim compensation based on the Helms-Burton Act. I'm waiting to see how Obama is going to revoke a federal law without going to Congress. He is a constitutional lawyer, after all. Maduro is not the only one betrayed by the Castros. The FARC has declared a permanent unilateral ceasefire, no doubt under duress. Mr. Obama has done what he was able to do, under the law. It is up to the Congress to repeal Helms-Burton. Mr. Obama understands this very well. But his move will have benefits for the Cuban people, perhaps only slowly at first, but over time, much will change. Opening Cuba to more outside influences will help grow awareness of what is being denied to the people. Over time, they will demand more freedom, and over time, they will get it. The past policy of isolating Cuba, is an abject failure. Mr. Obama's action is historic and long overdue. Abject failure in what sense? There are stands that we must take at times, that have no other motive than principle. and that is enough. From what I have seen of recently arrived Cubans, they are not impressed by the work load given to them in our harsh system....to much time has passed, and irrevocable changes have come to pass. Besides if helping Cubans is at the expense of Venezuela I am not interested. Will opening the doors lead to a Democracy in Cuba? Pure FANTASY.The Cuban dictatorship had already been accepted by all of Latin America and Europe , and with the US joining in, it's going to be just more of the same.Nothing will change.Democracy is in retreat all over the world in this moment. Some third world countries feel more attracted to the Chinese and Russian models than to Democracy.You can easily combine dictatorship with trade and some Capitalism.Many people thought that with the opening to China, it would evolve into a Democracy...laughable at this point. US's Cuba policies have been the ever-lasting failure of JFK's foreign policy for 50+ years . Antonio...ufff..finally somebody that sees clearly. This is another folly by an obama trying to get into the history books; it has no weight because of the existing law, like the immigration shenanigan, because you see now there are 20 M illegals processing their permanent legal status in the US...right??? his silly executive order won't help a single immigrant, but it lit the internet for all of a day or two and then it was gone. Just like this "momentous" agreement won't help a single oppressed Cuban. Curious how the internet is lit again with it, but it will be gone in two days, and filed under the "obama worthless crap" folder, which by now is huge. While the castros remain in cuba, it will never be free, and Vzla is not going to see democracy again...such a tragedy...and to think there are many leaders in the region working to get their countries to look like cuba and vzla. Too many reading too much into this. Yes Cuba had started negotiating with USA 2 years ago, they have recognized their economy is nothing and they need the USA. The USA put way too much time into the policies of embargoing Cuba over something too long ago. There is terrible dictators all over the world that the USA deals with, so why not sell to Cuba, why not enjoy travel there and why not smoke Cuban cigars. Heck people of the USA have enjoyed Baccardi Rum for how long and it is Cuban. Not the Bacardi drunk in the USA. That is from the Puerto Rico based company. Bacardi was expropriated without compensation in 1960 by the Castro regime. The Cubans haven't done much with the stolen brand. You can buy and drink the stuff produced in Cuba, at your own risk. Better to buy the Bacardi rum produced in Puerto Rico, made to the original recipe. Who's talking about horse piss when you can drink Diplomatico, Cacique or Santa Teresa. My dream is to get one day a Centenario from Carupano. Ecuador, Bolivia, Argentina, Venezuela, and the Humala presidency of Peru, are all facing a wall today. Together they will all fall, but to different levels. Daniel dixit: "But what worries me the most about the whole Raul-Obama deal is that a wind of impunity is blowing through the Caribbean. Thousands of Cuban criminals that supported the Castro horrendous dictatorship are now going to go Scott free." Dano, I have smelled that impunity waay up north, over the many years that I lived in Toronto. In 2002, at an artistic event celebrating a group of pro-photographers who had gone to Cuba, I was horrified to hear the keynote speaker: the Cuban consul, who spoke outside his moral authority, against the US sanctions on Cuba, never mind the other side of the coin -- the Cuban provocations, the fact that the US is Cuba's largest trading partner -- not on credit, but for cash. Regrettably, North American dummies, especially those in the most northern latitudes would never know geopolitical realities for all the press passivity that occurs with every injection of propaganda. The abuse was of such magnitude, that I was compelled to write what turned out to the lead letter in the principal newspaper, the letter made larger by the editor's selection of a huge photograph of Fidel. But I came across worse smells at two universities. One happened while I walked near a university residence, in downtown Toronto, one summer. The Cuban accents (bien machucado) came from several men that might as well had had "malandraje" written on their T-shirt. Tenían un aspecto MALO. You could smell it, figuratively speaking, not sure if they were regular students or taking courses during the summer. But at least that was more honest than Chilean Marxist Martha Harnecker , now a Cuban apparatchik, and at one time, promoting her little book on the interviews of leaders on the left. In sum, like an uncontainable disease, Cuban impunity has spread long ago, beyond the Caribbean. To me this entire embargo has been the repudiation of 500 years of shared history. My great grandfather fought in the SA War, my grandfather was married in Habana. Trade ties lasted for decades, friends, family FISH! Some idiot experimenting with communism should have been laughed off the stage except for the embargo and the clownish Bay of Pigs stunt. The Castros would not have lasted 10 years without the idiocy of the US State Dept and Florida Politics. You underestimate the power of other countries. ...and the power of cults of personality. The "clownish Bay of Pigs stunt" would have brought down the communist regime in days if Kennedy hadn't betrayed the invasion effort. The cowardice of one man resulted in this nightmare that has lasted decades. I am not at all sure that air cover would have made a minor raid like the Bay of Pigs a war winner. The population was with the government by in large, especially the population that would fight. Also, the Cuban opposition flew B-26's, a great WWll fighter/bomber, but absolutely no match for MIGs. Their intent was to destroy the main Cuban airfield, closest to the landings, thusly preventing the MIGs from entering the battle.. This they failed to do. Without air cover, the mission was doomed. Most importantly, the American Navy never planned to offer air support. The CIA miscalculated. They believed that a popular uprising would aid the landings, just as the CIA thought, so many years later, that the Iraqi's would all jump on the American bandwagon once Saddam was overthrown. History repeated itself, as the CIA was incompetent, once again.